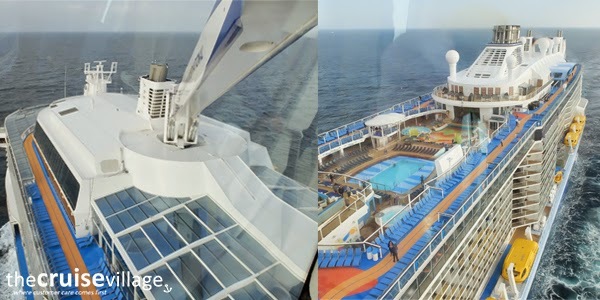 Cruise News & Cruise Blog :: My Cruise Blog: A Weekend Onboard Quantum of the Seas - Cruise Review! 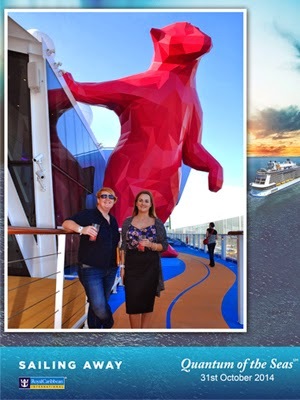 A Weekend Onboard Quantum of the Seas - Cruise Review! 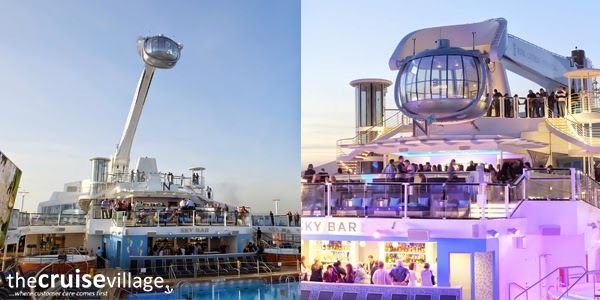 After an awesome weekend on board the world’s first smart ship, Quantum of the Seas, we thought it would only be fair to share our experience and thoughts! As we arrived at the terminal we were promptly greeted by a member of staff who labelled and took our suitcases away to be delivered to our stateroom. Upon entering the terminal building we were directed towards one of several members of staff equipped with a tablet each, our passports were scanned, (which brought up our details and photograph that we had previously registered through online check-in) our boarding pass was stamped (which we previously printed after online check-in) and we were able to proceed straight through to security & then into the waiting lounge and shortly after onto the ship! As promised, there were no lines to wait in, no forms to fill out and nor was there a check-in counter. This new procedure also meant that you would embark the ship using your printed boarding pass and your room key/SetSail pass is found outside of your stateroom in an envelope - different to past cruises whereby you are handed your SetSail pass at the terminal during check-in – but it worked & saved time. Sidewalk to ship in 10 minutes? Yes, if you have completed your online check-in correctly & everything is running smoothly at the terminal, you’ll leave your luggage upon arriving at the terminal and be on-board in 10 minutes. 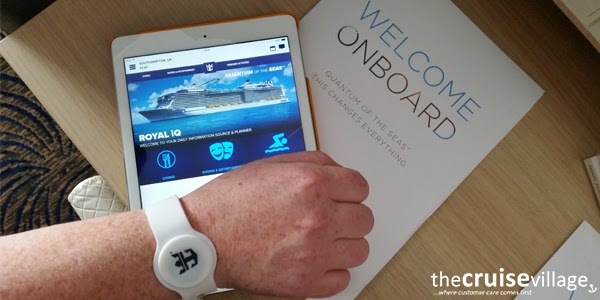 Along with our SetSail passes we were provided with RFID Wowbands – a wristband which acts as a room key and is also used to charge drinks and other purchases to your onboard account. It was very convenient, you didn’t have to get your card out each and every time you purchased a drink or when you nipped back to your stateroom, you simply present your wrist to the pay point or to your stateroom door. And although not the most stylish accessory, the majority of passengers were wearing them! We found the online Cruise Planner and Royal iQ smart phone app very convenient; it works well. We booked ourselves into a show before we embarked on our cruise using Royal Caribbean’s online Cruise Planner and these reservations showed up within the Royal IQ smart phone app and on the television in our stateroom! If you connect to the Wi-Fi onboard you can use the Royal IQ smart phone app during your cruise to make reservations and check your schedule – we found this very useful! And if you do not have the smart phone app there are IPads available at guest services where you can make reservations for dinner, book spa appointments, book shore excursion and much more! The day we boarded the ship we were keen to explore and check out all the innovations onboard! We headed straight up to top deck, firstly to order a strawberry daiquiri from Sky Bar and secondly, to watch the North Star as it rose 300ft above the ocean! 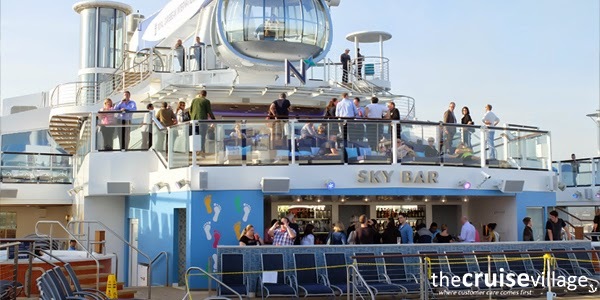 “Before I boarded Royal Caribbean’s Quantum of the Seas, I was extremely sceptical about the North Star and my honest belief was that this was a ‘gimmick’. How wrong can one be? It was the best part of the whole ship experience by far and this is without a shadow of doubt, the ‘Have to do experience’ whilst on holiday. If you do nothing else – do this! You will see from my pictures that the sun was shining which makes all the difference. When the sun went behind the clouds it was good but not as awesome as when the sun was out and you could see the sea shimmering and the ship in all her splendour. From the North Star we headed towards the giant pink polar bear which stands on Deck 15 & of course we took the opportunity to have a photo taken! 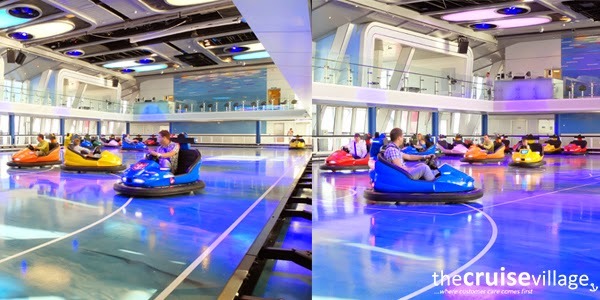 We then continued into SeaPlex, a brilliant multi-functional area that hosts indoor activities such as roller discos, bumper cars and even a circus school. At this particular moment the bumper cars were in action and who can say no to a ride on the bumper cars? It was great fun and it was great to see a variety of age groups joining in! After a very bumpy ride we left SeaPlex and continued towards the aft of the ship where we found both the Flow Rider and the Ripcord by IFly (sky diving simulator). 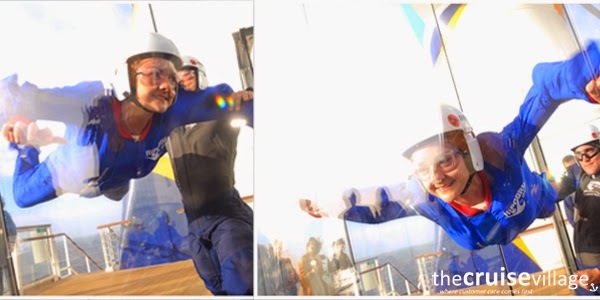 Both are fantastic experiences & although we did not try out the Flow Rider onboard Quantum of the Seas, a few of us have tried it out on other Royal Caribbean ships and it is great fun – but difficult to keep your balance, so expect to fall! I was fortunate enough to experience the sky diving simulator and believe me, it is awesome! Before you enter the wind tunnel you are shown a video that explains your body position and which hand signals to look out for to reposition your arms, legs and chin. After the safety brief you are suited and booted in overalls, trainers, goggles, ear plugs and a helmet and taken up to the wind tunnel with your instructor. A few of the instructors gave us an impressive demonstration before inviting us one at a time into the wind tunnel to experience it for ourselves. It is slightly nerve-racking as you are called towards the wind tunnel for your turn, but the instructors are great & help you to get into the correct position. The feeling as you ‘float’ in the wind tunnel is exhilarating & although you know that you are not falling 15000+ feet from a plane the feeling of the wind in your face is not too dissimilar. Oh and the fact that you can see the ocean surrounding ads to the experience! After a quick adrenaline rush it was time for another drink – where else to head than the Bionic Bar, a bar that consists of two robotic bar tenders to prepare and serve your drink and an iPad to order! We were unable to order a cocktail at this particular time & if I’m honest it was more of a ‘gimmick’ – we did see it break down a few times! But when we did see it in use, it was rather impressive. 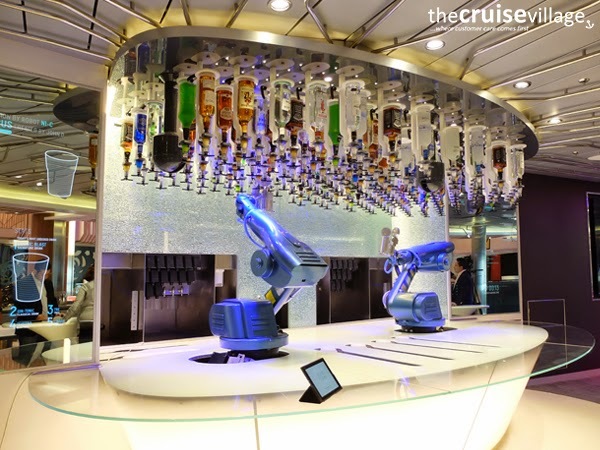 The concept of being served your drink by a robot is exciting - The robots are set up with great precision in order to serve you the correct mix of spirits and sodas and then pour them into a cup ready to serve. We did happen to see one of the robotic bar tenders drop a cup (fortunately it was empty) but it was interesting to see that it noticed the accident and replaced the cup with another. My personal thoughts? I prefer to be served by a human bartender – I like the personal service of a human bartender! The first evening we were booked into the show at Two70. I have to say Two70 is an impressive venue, by day a relaxing ‘café’ and by night an amazing innovative show set. The 270 degree panoramic view by day transforms into a ‘Vistarama’ by night. This particular show was called Star Water. The production was amazing – the stage is brilliant, it moves up and down in various places, people literally appear on the stage from nowhere and there are areas in the roof for dancers to drop down. But most impressive was the robotic screens and the beautiful 270 degree Vistarama projectable background – this brought the show to life! One thing I will say is the layout of the room is ‘different’ to say the least – so get there early and find a good seat – I highly recommend the seats in the middle at the front! As you would expect, the food was delicious! Unfortunately we were unable to experience all 18 dining venues as we were onboard for just a short 2 nights. The day we embarked we stopped for lunch in Johnny Rockets – this isn’t the first time I have eaten at Johnny Rockets, but I couldn’t resist their delicious all-beef hot dog and thick chocolate milkshake! The first evening we were booked into The Grande Restaurant, a beautiful and elegant restaurant where every night is a formal night – so dress to impress if you are dining in The Grande! The food was superb. What do we recommend? The Beef Carpaccio to start and the Mediterranean Rack of Lamb for main (until they change the menu of course)! We couldn't choose between the desserts so we ordered all five (between the four of us) & what a brilliant decision this was! We chose to dine in Silk on the second evening, and what an experience this was – a complete change from The Grande! The menu is influenced by the tastes of China, India, Japan, Thailand and Vietnam – full of pan-Asian flavours! We were spoiled for choice and so the waiter recommended we had a selection of the starters between the 6 of us; my favourite? The Vietnamese Tacos for sure! For main I had the Hibachi Steak – the meat was delicious, and the Wasabi mashed potato that is served with it is to die for! The cabins are lovely, as you would expect… great thought has been given to the design of the new cabins on Quantum of the Seas, maximising space and ensuring comfort. We were fortunate enough to be staying in balcony cabins (the D4 category) and there’s plenty of space, even with the furniture, on the balcony. The beds are super comfy, and there’s handy plugs next to the bed (something that is often missing on other ships). A very useful addition to the power options in the cabins are the double USB ports, meaning you only need to take your devices’ cables rather than the plugs themselves! We also noticed that we had actual coat hangers… yes real ones! And whilst we’re on the subject of storage there’s tonnes of it! There’s even baskets for shoes on the back of the wardrobe door! Of course for those wishing to spend more time out of the cabin than in it there are new options when it comes to inside and oceanviews as well. Inside cabins now give you the choice to bring the outside inside, with the introduction of virtual balconies. This is essentially a floor to ceiling plasma screen that shows exactly what you would be able to see outside if your cabin had a balcony! It’s a great idea, and makes the cabins feel more spacious. Oceanviews have a really good sized windows, but we have to say it’s worth the upgrade to the F grade Superior Oceanview. The difference in space between a standard and superior oceanview is noticeable, but more so than that… due to the position of the cabins, they feature an enormous round window that offers incredible views. But if you fancy one of these you have to be quick as there’s only 8 of them on board! As this is Royal Caribbean there obviously has to be a WOW factor, and this is produced by the Loft Suites (I have to admit that on entering the first loft suite the first word out of my mouth was “wow”!). These suites really are something… from the gorgeous furniture (including an Eames-style chair) to the unique art in each suite, and the absolutely incredible views from your double height balcony doors. Upstairs the beds look out over the mezzanine and out to sea, and for now we’ll just have to imagine waking up to that view… And for those that might be worries about missing the TV that’s downstairs, don’t worry… at the flick of a switch your TV upstairs will appear from the ceiling! The loft suites are everything you’d want them to be when paying a premium for a suite… they’re plush, decadent, uber-comfy, and offer you something that we realised we miss when we cruise… going upstairs to bed! The ship is awesome, the décor is classy and sophisticated and there is a good balance of adult entertainment and children’s activities – great for all the family! Does it live up to expectations? Yes, yes it does!